Pop the champagne and let's toast to you and your beau. 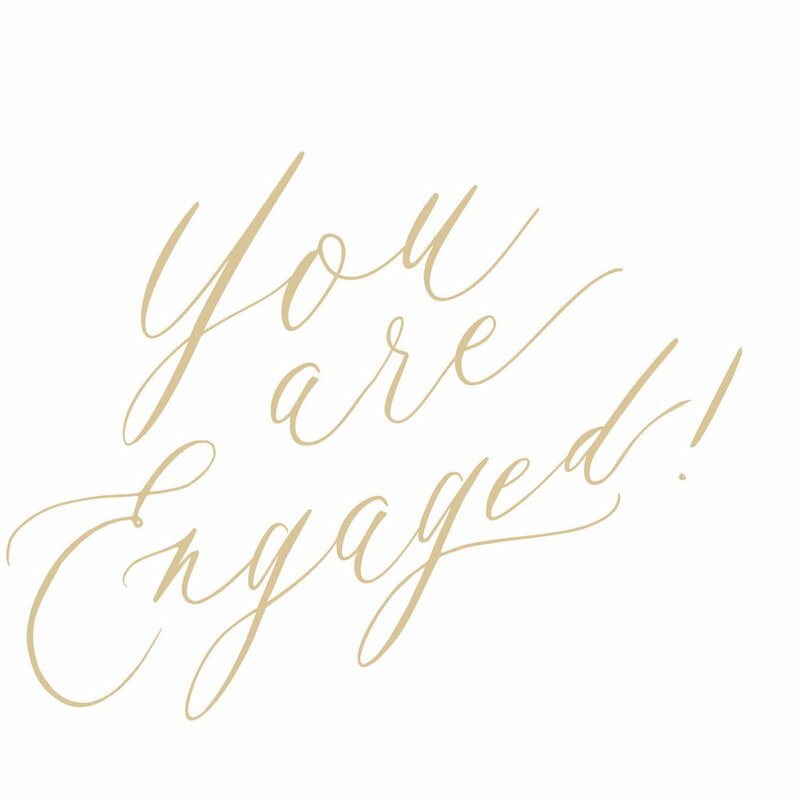 You're engaged! to the last thank you note, and beyond, we've got you covered! Our month-by-month guide is based on a one-year engagement. Fine tune it to suit you best. If you have questions, just let us know! Grab the pen and paper, it's time to make that guest list! Be sure to have your list approved by both families, then count your households to see how many suites you will need. are based on number of households, not the number of guests. suite with us, now is the time to start! Begin the custom process by contacting us and we will take it from there. Pricing will be sent to you, and we will gather all the information we need to design your wedding paper! Custom suites require four to six weeks of design time for save the dates. Ordering collection save the dates? Place your order 8 to 9 months out (depending on your wedding) to ensure you stay on schedule. You will need to make sure you pillow in some time for addressing your save the dates as well. If your wedding is out of town, or you are expecting the bulk of your guests to travel, order your save the dates even sooner so you can mail them in plenty of time. This gives your guests lots of time to book a flight and a hotel room. We recommend mailing your save the dates eight months out for weddings that require a good bit of travel from your guests. If most of your guests are local, six months gives your guests plenty of time to dust off the dancing shoes and put your date on the calendar. We recommend ordering pre-wedding thank you notes at this point so they are ready to use after wedding showers or early gift giving from guests. Use your double monogram with the initials of your first names, and your notes are good to use before and even after the wedding! Our custom clients will begin their invitation suite design process as soon as save the dates are mailed. We will follow up with you to talk through the design and then collect the information we need to design your suite. Our collection clients should place invitation orders at this point. This allows us one week proofing time as well as a week of production time before your order ships. Your order will ship in its entirety, including envelopes. At this point, you can send the envelopes to your calligrapher. We do not provide guest addressing at this time, but would love to refer you to some of our favorite calligraphers! Most calligraphers will ask for envelopes at this point so they are ready in plenty of time for mailing. We are happy to provide envelopes when needed for our custom clients. Just let us know when/where to send! Once you receive your invitations from us, you'll want to follow the timeline below for mailing. As soon as you receive your invitations from us, take an entire suite, including your envelope and anything that will be mailing inside of it, to the post office. Ask them to weigh it and tell you how much postage is required to mail each invitation to your guests. You will need to buy your stamps based on this. Grab your bridesmaids, a glass (or two) of the sparkly stuff, and stuff those envelopes! If we printed your return address, you are ready to roll! If you bought a return address stamp from us, stamp the back flap, put your postage on the front, and you are all set. Be sure to take them to the post office to mail. Your guests should be responding by the date given on their response card, which is typically 3 to 4 weeks before the wedding. If it's getting close and you need a yes or no from your guests, send a quick text, email, or pick up the phone and check on them. Sometimes this info is crucial for catering companies and venues.